Like most parents, I come up short in lots of ways. But there is one thing I am committed to as a mom that I have yet to fail on: birthday cakes. (I probably should knock on wood after making such a bold statement!) I blame my own mother for this obsession, thanks to the truly memorable birthday cakes she made for me as a child. Each year I let the kids choose whatever they want for their cake and then I tackle it. So far I’ve had pretty good success and I love sharing the cakes with you so you can make them, too! Anna had her birthday last month and requested a hamburger birthday cake. (This girl has a thing for cakes that look like savory foods, apparently.) It was her “family year,” which means no party, just a fun night with the fam. Rogue One came out on her birthday, so we went and saw the movie together. She could pick anywhere to go out to eat but decided to do takeout hamburgers and come home to eat in the living room while watching old Gilmore girls episodes. Naturally a hamburger birthday cake was in order! Anna and I did some searching on Pinterest and found a lot of ugly hamburger cakes as well as a lot of cakes that were just too much work. But then one caught our eye on a blog called Gluesticks. The mom had used unfrosted chocolate and vanilla cakes to make the bun and hamburger patty. Genius! 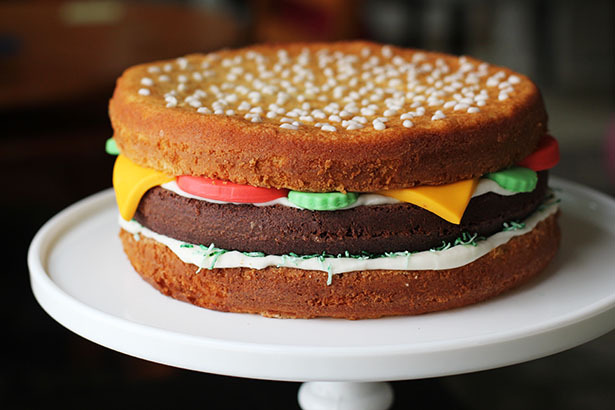 Make 2 yellow cake rounds and 1 chocolate cake round, all the same size, for the bun and hamburger. For the lettuce: toss shredded coconut in the green liquid food coloring. Tip: I didn’t let the “lettuce” hang off the edges enough, wish I had concentrated more coconut to hang over the edges so you could see the lettuce better. For the veggies and cheese: Either use marzipan or white rolled fondant. Separate and make a few different colors – red, green and yellow-orange. Roll the fondant/marzipan flat then cut into the shapes you need. I cut triangles freehand with a knife in the yellow fondant for the cheese. I used a medium-sized, smooth-edge round cookie cutter for the tomatoes. I used a small-sized, ripple-edged round cookie cutter for the pickles. For the seeds: Pipe white frosting on top for the seeds! I recommend using smaller round cake pans. I used my 9-inch cake pans and, well, it was SO MUCH CAKE. Plus I think the dome would have held better if the cake had been smaller. Bottom line: 9 inches was too big, 8 inches probably would have felt too big, too. However, those sizes will work for sure if that’s all you have or if you do in fact need a lot of cake. Otherwise, go with smaller cake pans! Make sure you grease and flower the pans REALLY WELL and use parchment paper on the bottom. My cake ended up sticking to the pan a little too much on the edges in some parts. Those parts did not look pretty and I had to hide them in the back. Click here for my cake decorating post with TONS of tips for making and decorating cute cakes. That post also includes the buttercream recipe I used. Happy hamburger birthday cake making! I love this cake! 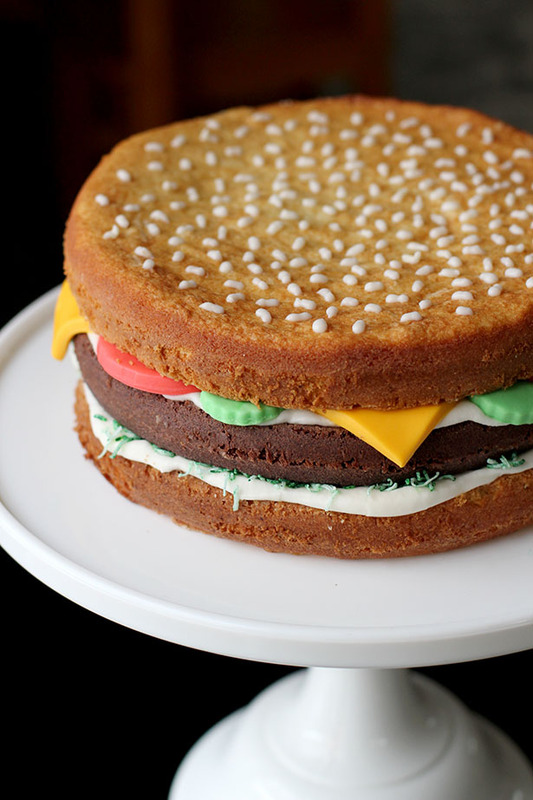 My son’s birthday is coming up in a couple of weeks, and since he loves cheeseburgers, we are making this for him. I can’t wait! I’ll let you know how it goes, but I have a feeling mine won’t look as good ;). Thanks for the great ideas! So cute!! I bet she loved it! What a lucky Anna! Very well done! Cute idea but…did she want fries with that? By the way, this was the Nachos cake — it was pretty epic!